After last week’s thrilling Essex Invitational, Division 1 States delivered just as much action and weather changes, not to mention a team finish that came down to a single point on the boys side. The girls team from Saint Johnsbury came away with another team title, even without their star athletes, Katherine Cowan and Grace Cooke, a testament to the depth of that team. Their winning margin was 44 points over South Burlington and 44.5 points over Essex. The boys competition was tight between Essex, MMU, and Saint Johnsbury throughout the entirety of the day; prior to the 4×400, the score was Essex-120, MMU-115, Saint Johnsbury-111. MMU did all that they could, winning the event and reaching 125 points. All Essex needed to do to win was secure third place behind them. Coming to the final exchange, Essex was sitting in fourth place behind MMU, SB, and BFA, luckily for Essex, their anchor leg is Jamaal Hankey, who dispatched BFA and came across the finish line in third place. Essex wins 126-125. If this were to be Burlington Invite scoring style (boys and girls scores combined), the final score would be Saint Johnsbury-245, Essex-215.5, MMU-163. Anybody who looked at the results of boys long jumps must be thinking, ‘wow, there was something in the water today’. Jasper Reed set a state record and jumped 23’, while Ryan Guerino jumped 22’ 7”, which would have been another state record had the Reed not jumped 23’. To even be on the podium required a jump of 20’ 10.5”. For context, last year’s podium only had a single jumper over 21, and interestingly, MMU’s Skye Douglas-Hughes jumped 20’ 10.5” at the past two state meets, the only difference is that last year he got 2nd, and this year he got 6th. In reality though, there was nothing in the water. For a hint on what was really going on, just look at the girls jumps results; almost every jumper was below their seed by a foot, and the two pits face opposite directions. A big congratulations to Brattleboro’s Jasper Hill for becoming the first Vermont high schooler to ever break 23 feet. Go ahead and measure 23 feet in your house. It’ll shock you how far it is. The next mark is 24 feet, which only three Vermonters have ever done before. Reed will be taking his talents to UVM next year, where he’ll be a valued member of the Catamounts track and field team. -MMU boys put four athletes through to the 100m final. -Saint Johnsbury girls scored 78 points in field events. -Essex and Saint Johnsbury girls combined to score 89% of the hurdle points. For those of you that have competed at the college level, you’ll know that at certain meets you are only allowed a certain number of athletes. 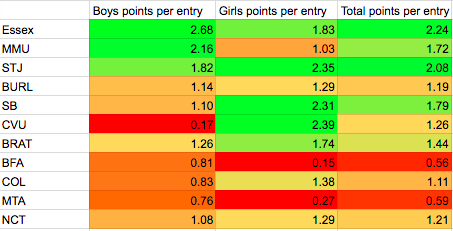 To put ourselves in those shoes for a minute, we were curious how each team scored based as a function of points per entry. As it turns out, the larger teams also seem to have the most potency per entry. On the boys side, the top three teams were Essex, MMU, and STJ, while on the girls side, it was CVU, STJ, and SB. Those mirror almost identically with the actual unadjusted results. That all but wraps up track and field competition for the spring 2018 season in Vermont. It has kept us all on our toes with records being set at every big meet, and exciting finishes in many races. To all the athletes that are competing this weekend at UNH, best of luck, and make the rest of us in Vermont proud!